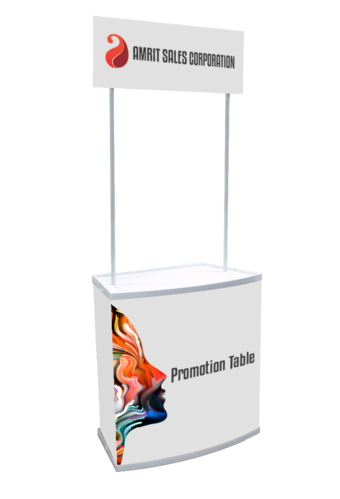 Our Promotion table ABS counters display for marketing events, mobile sales and promotions. The promo counter display is suitable for in-store promotions and demonstrations in environments such as supermarkets and shopping centres. Commonly used by telecommunication and mobile companies in markets and showrooms because of there ease of use and functionality. Lightweight plastic, flat-pack promotional unit 6kg. Header Banner Size: 32" X 10"
Counter Front Banner Size: 31.5" x 32"